We’re having very good talks. There’s a chance that something very exciting could happen. This is a deal that would be signed by me. I’ve been in touch with Congress. I’ve been telling many of the people in Congress exactly where we are. We’re, right now, getting a 25 percent tariff on $50 billion worth of goods coming in — mostly technology and high technology. We’re getting a 10 percent tariff on $200 billion worth of goods. The 10 percent goes up as of March 1st. It goes to a 25 percent number. So we’d be getting 25 percent on $250 billion. And there’s about $267 billion that’s un-tariffed, untouched, which we’ll discuss later. But if we could make a deal, we wouldn’t have to bother with that discussion. So we’ll see what happens. But we’ve had very good talks. As you know, Mr. Lighthizer has done a great job. But it’s only a great job, Bob, if you get it finished, right? PRESIDENT TRUMP: And if it’s a deal that’s a good deal for both. PRESIDENT TRUMP: And, Steve, great. But it’s only great if you get it done. Wilbur, Sonny — Sonny doesn’t care; he just wants a lot of products being bought from the farmers. Is that right, Sonny? That’s what you care about. Sonny is more interested in the farmers than he is any other aspect. But Larry Kudlow, Mr. Ambassador — the longest-serving governor in the history of the country, as you know. And now he’s ambassador to China. But he was the Governor of Iowa for 24 years, right? AMBASSADOR BRANSTAD: Twenty-two years and four months, yeah. AMBASSADOR BRANSTAD: That’s right. That’s right. PRESIDENT TRUMP: — (inaudible) from the time. And you’ve done a great job as governor and you’re doing a great job as the ambassador to China. And I might tell the story that when the ambassador was a young man from Iowa, he was in China. And he was dealing with people from China — both in Iowa and in China. And he met a man who was a young man, and he is now the head of China — President Xi. And he said to his wife — he came home — and this was how many years ago, Mr. Ambassador? AMBASSADOR BRANSTAD: Well, 1970 — 1985 is when he came to Iowa. PRESIDENT TRUMP: — you met him in 1978 or so, right? AMBASSADOR BRANSTAD: I went to China in ’84, and then he was in Iowa in ’85. 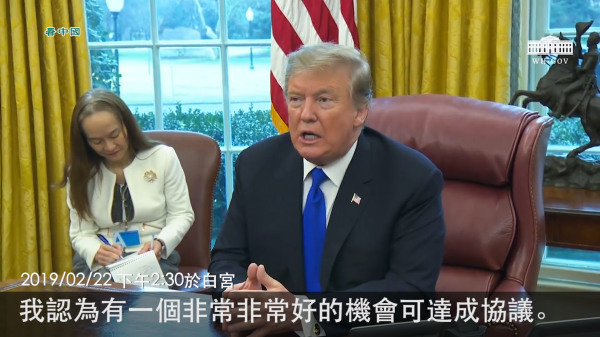 PRESIDENT TRUMP: So he met him, and he came home and he told his wife, “I just met the next President of China.” And they say, “How would you know?” He said, “Because the competence of this man is so enormous that I believe he’s going to be the next President of China.” And years go by, and he became the next President of China. And they like each other. So when it came time to picking an ambassador from China, I say, “I think I have the right guy. He happens to be governor of the great state of Iowa.” And you have done a fantastic job. But I thought that story was incredible. So, many years ago, he said that he knows who the next President of China is going to be. I thought — I just think it’s a great story. And his wife confirms it fully, so that’s good. So I just want to thank everybody for being here. We’re going to have discussions right now. We’re talking. And again, I think we’re making a lot of progress. I think there’s a very, very good chance that a deal could be made. We’ll be meeting at some point with President Xi — assuming we go further along the line, Bob. Could you say a couple of words to that as to the potential of a meeting — whether or not we will (inaudible)?